For a variety of reasons (didn't have a TV or internet for a while, was focused on other things, etc) I drifted away from serious NBA fanhood during the last couple of years. While I managed to get into the playoff games and especially (with a die hard Lakers fan for a co-worker) the Finals, I had drifted away from reading about the happenings of the sport and watching any regular season games. I've spent the last few months trying to get caught up. The most glaring thing that slipped past my radar during that time is an extraordinary book entitled The Macrophenomenal Pro Basketball Almanac written by the collective of minds that publish the blog FreeDarko. The book was released in November 2008 so of course I'm very late to the party but I must sing its praises anyway. I cannot remember the last time I was this blown away by a book of any kind, not just a sports book. It looks beautiful, with hardcover binding (no annoying dust jacket) and glossy pages each of which has the color and eye-catching presentation of a children's book. Read the words in it, and you'll see it's actually a book for adults, particularly those who enjoy and follow the game of basketball. For basketball fans this is a tablet descended from hoops heaven. The vision presented by the creators of this book portrays the NBA and its stars in what would be best be called mythological terms. When I was first flipping through it, I was actually reminded of Joseph Campbell's work. If that sounds a bit over the top, the writing does seem to maintain a humorous tongue-in-cheek backdrop the whole time while still casting its subject in a mythological and analytical light, throwing in references from the whole history of culture. The Almanac is a study of today's game broken up into six chapters, each devoted to an archetype like Master Builders (Kobe, KG, Tim Duncan) and Destiny's Kids (LeBron, Chris Paul). Each chapter contains three sections spotlighting players that embody the given archetype while each respective player has a "Spirit Animal" in their jocoserious profiles along with comparable players and other traits. The players are described through essays, artwork, graphs, comparison, stats, and it all goes together perfectly and looks great. While the writing is intelligent, clear and condensed, and the artwork is worth the price of the book, it is the presentation of the stats that is perhaps the most amazing thing about this book. I'm admittedly a stats geek when it comes to sports. Have been for many years. But I've never seen any book or website that presents the numbers in as cool and sleek a fashion as this book. The first chapter has a beautifully colored and very understandable graph distinctly showing how Kobe Bryant's 81-point game outdid Wilt Chamberlain's famous 100-point performance. Lamar Odom's uncommon variety of skills is highlighted in an extremely creative, brilliant graph comparing him to pretty much every other player in the league. Pictures painted with numbers and math. Above all, though, this book is about style and it is a wonderful celebration of it. The opening pages display FreeDarko's "Periodic Table of Style" with symbols to represent each part of a player's game, representing "exactly what occurs in an instant revealing style as a mix of the physical, emotional, spiritual." Each player's section features a different Style Guide breaking down step-by-step their signature moves. Tim Duncan's is perhaps the best of these as his two-page centerfold guide breaks down the "fundamental mechanical concepts" of his post moves. Amar'e Stoudemire's explosive array of dunks are also a Style Guide highlight. My favorite chapter is the one highlighting two relatively unknown players (the only chapter that combines two players); enigmatic, awesome, yet frustrating peacocks Josh Smith and Gerald Wallace. These two are given the FreeDarko treatment to the highest and most aesthetically pleasing degree, with a splendid, intensely colorful image of them in the style of Mayan art, a sleek and colorful graph of beads that displays their unique batch of skills, a short-but-sweet Style Guide, and a marvelous mandala inspired by the Aztec's calendar system depicting (of all things) the results of Hawks-Bobcats games. Other highlights include the "Lunacy of Artest" displaying the moon's phase during some of Artest craziest moments, the Yao Ming aggression chart comparing the layup/dunk ratio of NBA big men, the appreciation of Rasheed Wallace (with cryptic Wu-Tang reference included), the whole Amar'e chapter, the LeBron James essay, the "Alchemy of [Gilbert] Arenas." 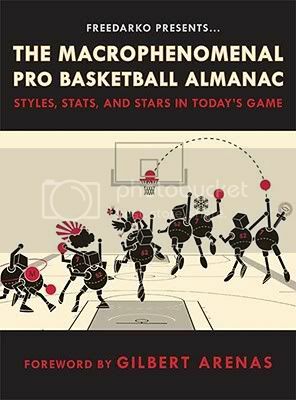 If there's an NBA fan for whom you need to buy a gift this year: get them The Macrophenomenal Pro Basketball Almanac. It is a masterpiece. It doesn't matter if someone has just a small seed of basketball interest, this book will make anybody appreciate the NBA more than ever. The FreeDarko peeps collaborated with Adidas for some commercials last year and the result was a couple of pretty damn cool videos. Check 'em out. The crew has also just released a brand new book all about the history of the NBA. It's one of the top things on my Christmas list. Check it out here. "I Killed the Devil Last Night"